Most people know the reason why there are no windows or clocks visible in casinos. If not, it is so that keen gamblers can focus on playing and won’t be destructed by the time announced via clocks. The window also subtracts from players attention, and most casinos prefer the punters to stay longer, which could be compromised by seeing that it is getting late via the windows. Many feel it only design gospel and that it won’t work in keeping players hooked for longer. When it comes to finding out, just how effective these casino designs are, it is best to turn to facts proved via research. The short version is that dark, maze-like designs are much more successful in the design of casinos than we might think. Any business based on getting an individual to ignore all the odds and to spend lots of money invests in ensuring that everything works towards a specific goal. Conventional wisdom does not work. The casino design or the layout of casinos, which most think is classic, actually comes from the designs of Bill Friedman, a gambling addict. He became a professor at the Universality of Nevada Las Vegas and lectured in casino management. To transform any hotel, he took over; he first studied more than eighty of the most successful casinos in Nevada. The main focus of the study was to determine what attracted individuals to the casino. The games are the same at all casinos; what is different is the packages. According to Friedman, he based his studies a bit later on what percentage of the casino visitors gambled and the rate of returning gamblers, because nothing else really mattered. Friedman’s findings became a book called Designing Casino to Dominate the Competition. The 630-page book includes all the analysis by Friedman as well as the design elements proved to be part of casinos’ success. Tracking casino in Nevada and across the globe finished in 1990 and the conclusions by Freidman all based on his findings. These included his observations, combined with elements of success, including casinos making the highest amount of money by attracting the most gamblers. 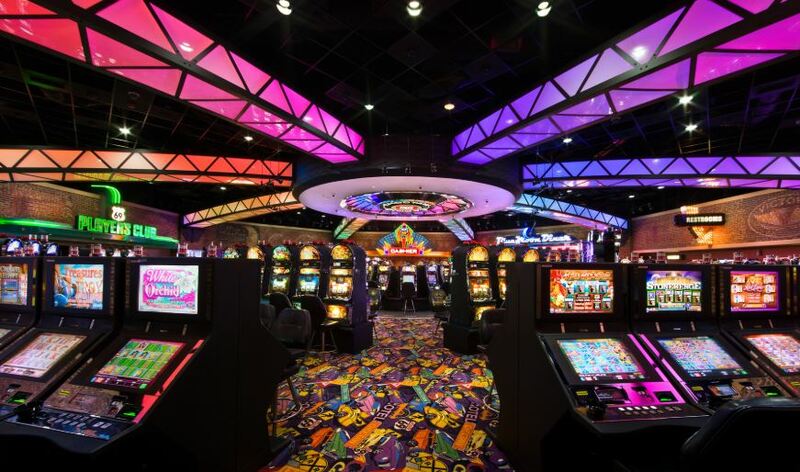 Friedman’s analysis also included the evaluation on casinos based on the number of slot machines, slot wins, slot occupancy rate and the number of players. He further studied this by evaluating the slot-to-room ration, while focussing on the number of players that came from other competitors to these successful casinos. The Friedman principles include the arrangement of gambling equipment/games placed immediately in the casino entrance. The maze-type layout that is wide, long and features aisles and straight passageways. High ceilings vs low ceilings and great decorations vs gambling machines use as décor. Gambling equipment beat emphasised via pathways. Successful hotels mostly place the casino near the entrance, have few décor items inside, and the ceilings are low. The layout of the premises is designed to lead visitors back to the casino gaming area, and that is called casino design in action. Those fortunate to have a tour of the Federer’s palace says this art-piece-home is fit for a king and in this instance, it is the king of tennis. Rodger Federer is a 17-time Grand Slam Champion, and his glass mansion situated on the shores of Lake Zurich cost €6.5 million. It’s a real piece of art, and the three-story haven wrapped in class form floor-to-ceiling features a breath-taking view across the Lake Zurich and features a fantastic pool. Federer calls his new home The Residence; all three floors are glass-wrapped. Each is completed via a massive balcony the offers truly magnificent views over Lake Zurich. The glass-walled palace is built on a 1.5 acres plot and offers underground parking. Plenty of room is offered to wife Mirka, Federer and his two sets of twins that includes boys Lenny and Leo and the 5-year-old girls called Charlene and Myla. Despite the glass walls the hillside location offers no insight into the home as it is ideally situated to provide the best look over the lake. Developer Kamata calls this home one of the most impressive structures, designed to offer Federer and his family an astounding view no matter the room they’re in. The house is furnished in a minimalistic fashion that further adds to it majestic look. The tiered modern hillside hideaway now called the Residence should be renamed to Rodidence. This masterpiece is built in Penthouse-style and offers the perfect view anyone could ever achieve via any other design. Tennis fans the world over agree that Federer is the coolest tennis player who has wowed audiences for many years. He has subverted all expectations, stockpiling records and quieted critics for more than twenty years. Some say he still shows no signs of slowing down and his level of competitiveness is unprecedented for a man of his age. When the legend is not on the tennis court or the road he lives in Switzerland with Mirka his wife and their two sets of twins. The odds of having two sets of identical twins are 00009 or one in 110,000, which is what Federer described as having good fortune. After suffering injuries, Federer returned in 2017 to win Wimbledon and the Australian Open. He’s also grabbing three Master titles, and again he left his fans marvelling as only the full-fledged Federaissance can do. As unfortunate as it may be for his millions of fans, Federer will retire one day. It won’t be too much of a surprise if he appears in the royal box during Wimbledon matches. Sitting in the centre of the crowd that admired him for many years and still will for his class, suavity and generosity. With the 2026 FIFA World Cup moving closer new focus falls on the sports stadiums in Canada. The most significant sports stadiums in the country are situated in Montreal, Vancouver, Ontario and Alberta. Canadians love a wide range of sports, including cricket, American football, hockey, tennis, cricket and soccer. Sports acts as social glue, and it keeps the community together as thousands of Canadians flock to sports venues and stadiums to enjoy their favourite games. Several of the leading sports stadiums can accommodate thousands, and we take a look at some of the biggest. The Rogers Centre is located in Toronto, near Lake Ontario and opened in 1989. This stadium is currently the home base of the Toronto Blue Jays. Initially, the stadium was called the SkyDome, and it was purchased by the Rogers Community the name was changed to Rogers Centre. It was the first sports venue to feature a retractable motorised roof enabling the stadium to be perfect for both the opening and closing 2015 Pan American Games. The Rogers Centre hosts several events including soccer, basketball, football and baseball as well as other events such as sports exhibitions. With a 53,506-seating capacity, the stadium was also used for numerous concerts including the Steel Wheel Tour of the Rolling Stones. As one of the largest sports stadiums are built to provide multipurpose, BC Place is now under BC Pavilion Corporation management and the home grounds of the Vancouver Whitecaps as well as the BC Lions. During the 2010 Paralympics Games and the Winter Olympics, BC Place was one of the main venues. Opened in 1983, the stadium was closed for around sixteen months for upgrades and renovations in preparation for the 2010 Winter Olympics, and it currently offers to seat to 54,320 sports enthusiasts. The Olympic Stadium is another multi-events sports stadium and was used as the main venue during the 1976 Summer Olympics. It is often referred to as the Big Owe since it resembles the shape of a doughnut and can seat 56,040 sports fans. Since 2004, the Olympic Stadium is without a tenant, and due to both financial and numerous structural problems, it is now a White Elephant. The Commonwealth Stadium, also known by most locals as the Brick Field is the largest stadium and this outdoor sports facility features seating for 56,302 sports devotees. Construction on the Commonwealth Stadium started in 1975. In 1983 the stadium was upgraded and expanded to host 60,00 ahead of the Summer Universiade as well as the Commonwealth Games. The Commonwealth Stadium is the home ground of the Canadian Football League as well as the Edmonton Eskimos. Living large is on the map when you one of the masters in golf, and for Jordon Spieth that includes a $7.1 million mansion in Dallas, Texas. As a Masters Champion, Spieth earned around $53 million in 2015, and one of his most significant investments is his house that offers pure luxury, and it is a 16,655-square-foot mansion. Listed originally for $8.5 million the house part of the Platinum Series projects by Mark Molthan is easily affordable to one of the worlds best golfers. What stands out about the mansion is its golf-simulator room. The garage underground that offers space for twelve cars, the indoor basketball court and then basically the interior design is breath-taking. The mansion boasts a glass infinity pool, wine cellar, fire pit, and an Augusta National clubhouse mural. This is the perfect place for the super athlete to leave his green jacket. It is the young golfer’s second house he bought when he was barely 21, and the mansion features eight bathrooms and five bedrooms. Access to two private jet airports is offered by the estate situated in Creeks at Preston Hallow Jordan. Jordan Spieth was born in 1993 in Dallas, he is the oldest of three children and played basketball while he was studying at the Born University. While his mom enjoys basketball, his dad enjoys playing baseball, and he was blessed by both his parents’ talents in sports. While he is a keen football, soccer, baseball and basketball player, it was golf that he enjoyed most, and it later became his main priority. He was only nine-year-old when his parents decided to join the Brookhaven Country Club so he could start lessons with Cameron McCormick. Spieth won the US Junior Amateur Championship at the age of 16 and again when he was 18. He is the only golfer ever to win it twice, besides Tiger Woods. Spieth first earned low amateur states after his success at the Texas University, and he turned pro at the age of 19 at the end of 2012. In only a few years since then, he has gone huge on collecting trophies and winning championships. In his first year as a professional golfer, Spieth earned $3.8 million. During 2017 Jordan was worth $70 million. The first house he bought was the $2.3 million home in Dallas in the Preston Hollow neighbourhood. It is fair to say the 22-year-old is doing well for himself since he added the Dallas Mansion. The first home is a 7,738-square-foot home in Dallas featuring a magnificent chef’s kitchen, a wine closet housing 288 bottles of wine, five bedrooms, a media room, gorgeous bath, fireplace and an astonishing family room with views over the pool and manicured garden. 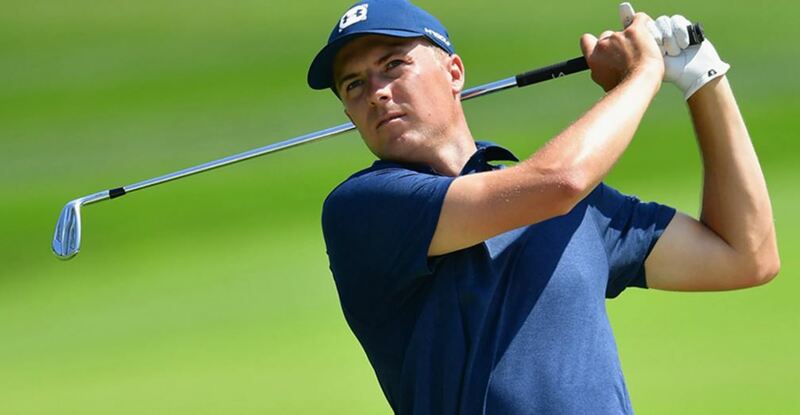 Currently, Jordan Spieth is the most marketable sports star and have an array of endorsements, including Coca-Cola, Wheaties, Titleist and Rolex. Whether you believe the statement that stars are born and not made. One thing you can’t deny is the massive incomes of superstar athletes like Tiger Woods earn. The famous golfer has owned a variety of different properties, yet the one that stands out most is his mansion located in Florida at Jupiter Island. 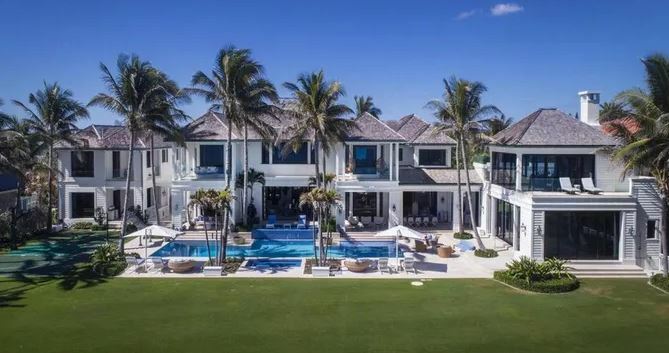 Woods and Elin Nordegren purchased the property in Florida in 2006 for $40 million consisting of 12-acres of grounds and features a beachfront house of 9,000 square foot. The Elin Nordegren, Woods relationship came to an end in 2010 when the couple filed for divorce. Which was also the same year the house in Jupiter Island got a makeover that included a practice facility for Woods. Cary Lichtenstein is a luxury realtor as well as a golf property expert in Florida. He described the Jupiter Island home of Tiger Woods as nothing short of phenomenal in 2010 when it was worth around $50 million. He also shared that it was the most expensive of all homes found on the barrier island. Forbes published that the most expensive property sale on the island was the home bought by Woods for $40 million in 2006. Jeff Realty’s Jeff Lichtenstein included the Woods mansion on his list of most expensive United States Estates. Which features all the most expensive properties owned by the wealthiest and most famous people in the USA. The prices of homes on the list start from around $2 million and end at costs of $65 million. The only other celebrity housed in the same class as the Woods mansion included that of Gre Norman, Celine Dion and Bill Gates. AOL Real Estates released details regarding the Woods mansion, and the list of luxuries includes multiple pools, a fitness centre, oxygen therapy room, tennis court, two master bathrooms, a gym, basement wine cellar, elevator, three-bedroom suites and a media room. While a separate guest house offers Tyger Woods the privacy, he enjoys when he is not able to enjoy his yacht also named Privacy. Some say athletes are born, not made. If true, they’ll need a crib. Superstar athletes are well compensated for their exploits on the field, court, course, ice, and track, especially in this era of $300 million contracts and endorsement deals. 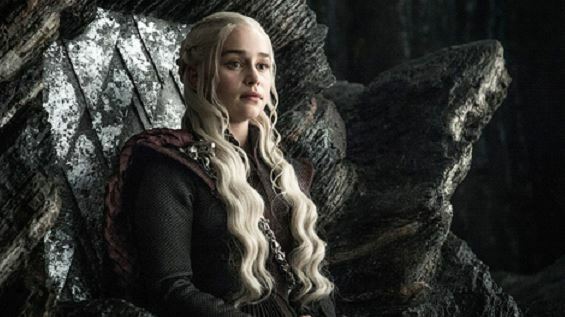 Their incredible success translates to A-list lives in spectacular homes featuring shark tanks, panic rooms, car elevators—whatever they desire. Here are 20 large homes of living sports legends. Woods’ 16,127-square-foot Jupiter Island mansion is more hazardous than most homes. His massive backyard is a unique four-hole golf course landscaped in his design. Toss in two pools and a basketball court. You’ve got a backyard unlike any other. There’s also a guest home, a private beach house, two yachts and a private beach. this is the ultimate home for any sports enthusiast. How impressed would your friends be if you showed up in tapered jeans designed by no other than the greatest athlete Cristiano Ronaldo. Welcome to one of the trend-setters of the year and to the official denim store of Christiano Renaldo. The CR7 denim fashion label is the latest to the clothing range by Ronaldo. The football star already has a clothing empire offering shoes and underwear, which again proves that the talents of this super-sports-star is boundless. His latest addition also shows just how much the footballer from Portugal loves his back pockets. 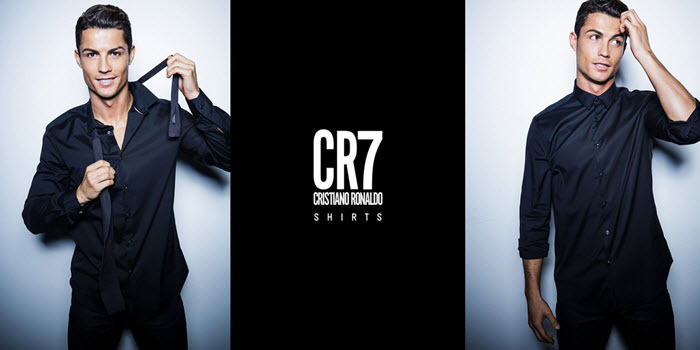 Ronaldo’s designs offer unrivalled levels of movability and comfort that are made to cater for all your fashion needs. The jeans are made from elastane and locking cotton in one of the most advanced processes of weaving. This ensures these are stretchy and offer unrestricted movability. The bad news is that his CR7 Label is jeans designed for men and the ladies will need to wait until the sports star decide to add ladies’ fashion to his range. Sports stars are not only energetic during the games, but they also seem to have double the energy on or off the field. Robbie Fowler is known for selling houses on the side and it is not only footballers that design their own fashion ranges. That makes it is well worth exploring at a later stage. One of the latest trends is that fans purchase all the clothing lines endorsed by footballers. For someone as fashion-conscious as Christiano Ronaldo, he not only stopped at endorsing clothing lines but created his own. Admirers across the globe have always loved how Ronaldo takes care of himself and always dresses like a fashion model. His appearance is what sells his clothing range. Anyone that takes pride in their appearance are bound to love the new denim label by the footballer. The online store shows off Ronaldo wearing jeans, the kind any fashion-conscious guy would buy if he wants to impress the crow. Cristiano Renaldo shared in an interview that his new range of denims are not only for the fans but also created for all men who share his values and want jeans that offers limitless comfort. The CR7 clothing range also includes moto white shorts, kick back charcoal shorts and rip back white shorts. His she shirts offer a luxurious look and include the crown navy shirt, Tyco blue check shirt, red camo shirt, ice white shirts, general army shirts and blue camo shirts. However, if you really want to impress, you’d need a jacket and the CR7 range. This includes ebony workman jackets, charcoal trucker jackets, waxed jet biker jackets, and shadow patch trucker jackets. A two-month-old tiger once was the Christmas present retired boxer Floyd Mayweather JR received. Mayweather still holds the record of 49-0 and regularly posts photos of him and his tiger on Instagram. As most professional sports stars earn substantial salaries, it is interesting to see what they actually spend their fortunes on. Here are some of the craziest purchased made by popular athletes. Every boxing fan knows Mike Tyson as well as his story from rags to mega-riches. There was indeed a time when Tyson had unlimited amounts of money to his disposal. He spent large amounts of dollars on cars, clothes and jewellery. However, when it comes to the craziest single item, he bought it is the gift he gave Robin Givens, his ex-wife which was a bathtub worth $2 million. It is often said that the Portuguese sports superstar could also be a model, and one thing Ronaldo knows how to do well apart from sports is living large. It is estimated that he has spent well over $4 million on cars and owns an Aston Martin DB9, Lamborghini Aventador and Bentley Continental. He also bought a GTC, Rolls Royce Phantom Drophead Coupe and a Ferrari 599 GTB Fiorano, to name only a few. Tiger Woods is not only a golf superstar. He really knows how to enjoy a truly extravagant lifestyle. He spent around $60 million on a property based on the water-front on Jupiter Island in Florida. The mansion features a diving pool as well as a 100 feet-long swimming pool. It also offers a gymnasium that is 5,700 square-feet and the long list of unique features also includes a training studio that offers four gold greens. Named the greatest player of all time in basketball, Jordan spent $30 million after he took the Jordan can fly Air trophy quite serious. He then went out and purchased a Gulfstream IV for himself and had it customised and emblazoned with the number 23. Mario Balotelli is known for his terrific-soccer style as well as his eccentric personality. Although no items are known, what they cost the Italian striker millions of dollars. He did spend quite a bit on fines issued due to his habit of parking wherever he feels and these accumulated up to $15,000. Known as one of the greatest boxers of all times, Holyfield is placed second on the list of boxers spending massive amounts of dollars. Holyfield is second on the list of big spending boxers as Tyson is holding onto the first position with all his might. Evander Holyfield reached quite a high position on the list of massive spenders once he spent $20 million on a property that features two bowling alleys and 109 rooms. Other big spenders include football star Chad Johnson who spent $100,00 on a customised truck in 2011 as a 32nd birthday gift to himself. Baseball star Jack Clark spend $717,000 on a Ferrari F-40 to adds to his collection of 17 other luxurious cars, although he did file for bankruptcy at the end of his career. 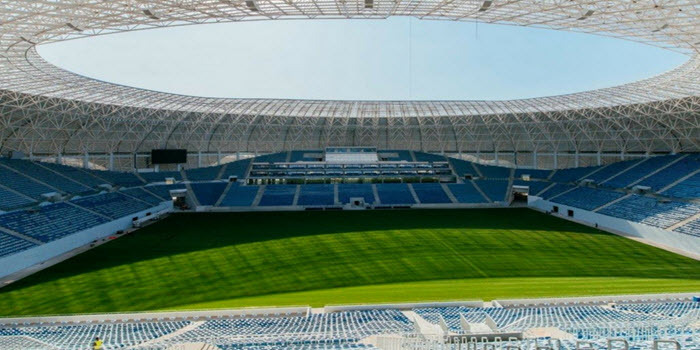 Devoted to football and Bucuresti-designed, the simply astonishing new Craiova Stadium with a 40,000-seat capacity is what will replace the Ion Oblemenco stadium in Romania. The design is a tribute to Constantin Brancusi, the Romanian sculptor, while the highly impressive main roof form was inspired by the work of Brancusi called Miss Pogany. The exterior volume gained is expressive during daylight while the enhancement of architectural lighted by night emphasise the design of the building whether it is viewed from close-by as well as from above or even from the centre of the town. The Craiova Stadium is iconic in the city, and it is a modern inclusion boosting the local area development. The stadium achieves UEFA category IV level, which is the highest of all and it will host matches such as the FRF Romanian Football League, UEFA Champions League, UEFA and FIFA National team matches. The Craiova Stadium’s playing field of natural grass dimensions is 105m x 68m which is ventilated, heated, drained and irrigated. The seating area is located over two levels, both close to the playing field, which offers spectators both optimum visibility as well as comfortable seats. The VIP skyboxes are placed between the two levels of seating. The building covers against the elements by enclosing both the spectator seating areas while it also encloses the under-the-stands secondary spaces via a single sculptural a perfect ellipse. The sculptural form of the roof increases the volume of the main bowl the sculptural form part of the roof opening to the sky, the mechanical ribs wrapped with translucent and transparent materials enhances the lighting of the architectural design. The spectators are protected against weather conditions by envelope materials chosen with regards to the adverse weather conditions, yet it still offers the natural light required and allows for the artificial photosynthetic systems. The Project Bucuresti proposes an approach with is ecological to the environment, yet sustainable technologies and materials incorporate the green energy sources such as ground source heating or even cooling when needed, photovoltaic cells, and deep well water sources. The development of the Craiova sports complex includes keeping the existing indoor multifunction sports hall, which was recently modernized and expanded, while it includes the addition of a new sports centre that will be dedicated to fencing sports built in areas available below the stadium stands the newly added athletics running track. It offers covered seating for at least 5,000 spectators it is incorporate in the training ground that is used for football. The landscaping is also improved at the complex and offers both a hard and soft landscape plus public parks as well as an exciting pedestrian walkway and efficient parking.